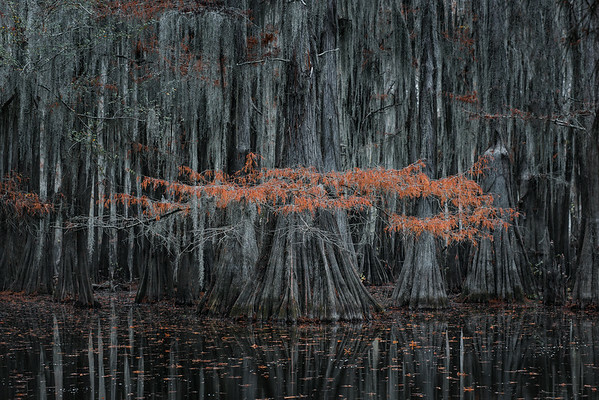 The Bald Cypress trees that live in the bayou swamps of the south are pretty awesome. I got my first taste of them when Sammi and I went kayaking through a few of them during a weekend trip to New Orleans. I knew I wanted to come back and photograph them during the right light. The best way to see these trees is by kayak. You don't want to be a in fast moving boat and you don't want to be in a boat with other people. Rent a single kayak, and explore! That's exactly what we did. We had arranged for kayaks to be waiting for us at the launch when we arrived very early in the morning and we were shocked to find a workshop had beat us to the swamp! Knowing we'd have to share the bayou with ~15 other photographers, we quickly hopped into our boats and took off at breakneck speed to get ahead of everyone else. As we got to the lake, David turned to us and pointed out an area that Willie and I should go explore. It was still pretty dark out and we were still using our headlamps to navigate, so we pulled onto shore and waited for the sun to come up enough for us to see. Willie and I both happened to look over and spot this one tree with its beautiful orange red leaves still intact on its lowest branch. The shape of these leaves forms a perfect mustache, and I couldn't help hear my friend Lacey talking about her cat "Moostash" in the back of my head. So the name of this photo is dedicated to her -- Mister Moostash!